On Wednesday, Fox News’ Bret Baier reported that the FBI’s investigation into the Clinton Foundation has been changed to “very high priority” which may mean an indictment may be in the near future. 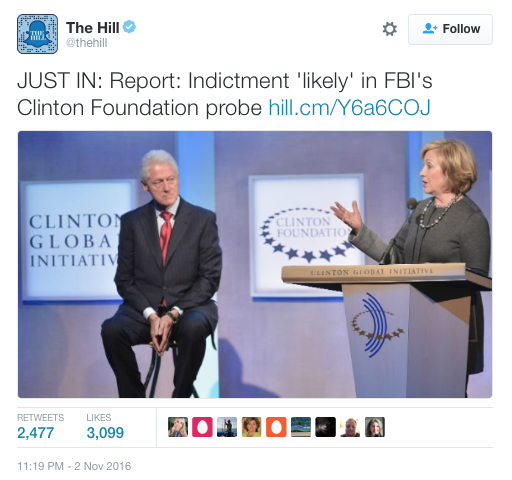 The FBI has had an investigation into the Clinton Foundation for more than a year, but with “an avalanche of new information coming in every day” the probe has been expedited. Sources close to the investigation told Fox News that FBI White Collar Crime Division agents have been interviewing multiple people in connection with the Clinton Foundation to determine whether or not pay-for-play was happening between their organization and the State Department during Hillary Clinton’s time as Secretary of State. Bret Baier reported that the laptops of Clinton aides Cherryl Mills and Heather Samuelson have not been destroyed as previously believed. Baier added that the sources pointed out that any immunity deal is null and void if any subjects in question prove to be lying at any point in the investigation. “They are currently combing through former Democratic Congressman Anthony Wiener’s laptop and have found e-mails that they believe came from Hillary Clinton’s server that appear to be new, as in not duplicates,” Baier said. “Whether they contain classified material or not is not yet known,” he added. Sources told Fox News that FBI agents are “actively and aggressively pursuing this case,” by interviewing the same people multiple times as new information arises. They are also comparing previous interviews with top Clinton aides to make sure all statements line up.